Nokia is obviously hoping the Lumia 1320 will hit the ground running and that hope isn't unfounded, considering the loud bang the 1520 produced and the solid record of the Lumia 520 and Lumia 620. Providing all the necessities at a reasonable price is a Nokia staple in the Windows Phone midrange. It's been a winning formula for the Finns in smartphones, so no obvious reason why it won't work in phablets as well. Or, maybe there're some after all? The 1320 is very late to the phablet scene to begin with, which means Androids have had plenty of time to feel right at home. The devices in question aren't just powerful in hardware, but some have hot glass bodies and even tricks such as a swiveling camera. Windows Phone 8 is proven to behave on less than premium hardware, but it's not the platform of choice for most game makers out there. As a result, the Lumia 1320 squanders some of the potential of that large screen. If not for gaming though, the Lumia 1320 has a knack for some serious work. With Windows Phone 8 you get probably the best document editing software on a phone and it will play nicely on the 6" screen. Then, there's the excellent SkyDrive integration to keep the files in sync and safe from harm's way. Not least, the free offline voice-guided navigation is certainly a nice perk too. And the Lumia 1320 will need every bit of those against rivals that match it on price and outbid its specs. The Samsung Galaxy Mega 6.3 is arguably the most dangerous rival for the Lumia 1320, matching its chipset and screen resolution. The Mega has a larger, 6.3" display, but isn't much bigger than the 1320 and is far lighter despite having the same 3,200 mAh battery. The strongest weapon of the Smasung is its Android 4.2.2 platform, but it also has the Lumia beat in the camera department with its better 8MP snapper. Its price is on par with that of the 1320, too. The Huawei Ascend Mate is next. Its 6.1" display packs 720p resolution, with a quad-core chipset ticking inside along 2GB of RAM. It's also lighter than the 1320 and packs a significantly larger 4,050mAh battery. Not to mention, it's cheaper. Dual-SIM functionality would've probably fitted the 1320 better, but the Lumia line-up doesn't go there. If a dual-SIM phablet is something you want, then the Acer Liquid S1 is a viable option. It too has a quad-core chip, runs Android 4.2 Jelly Bean and packs a 720p screen. It's also cheaper than the 1320. 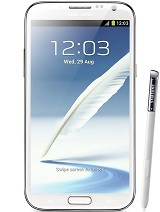 Nothing wrong with the good-ol' Samsung Galaxy Note II either. Sure, it's not the latest and greatest Android phablets can offer, but it too is less expensive than the 1320. Not to mention you get the pretty cool S Pen functionality that's good for both fun and work. The ASUS FonePad Note 6 looks tempting too with a 6" 1080p display. It's rocking a dual-core 1.6GHz Intel Atom CPU, 1GB of RAM and an 8MP camera. 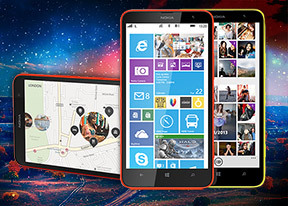 It's not only slightly cheaper than the Lumia 1320, but also weighs less. The fairly recent Oppo N1 is a clearly more expensive option but not by much, considering we're talking a serious cameraphone with a 5.9" 1080p display, Snapdragon 600 and a few unique features: a swivel 13MP camera, rear touchpad the O-Click remote. The Nokia Lumia 1320 will certainly find its place under the phablet sun but it seems at this point a number of droids can offer more for less. What we shouldn't underestimate is the outstanding Lumia 1520, which may as well be able to pull its sibling along. Plus, the success of the Lumia 520 probably means there's a core of happy Windows Phone users who may be ready for something bigger, but not too pricy.